The Holiness of God is Ligonier Ministries’ most popular and enduring series. Literally thousands of people have testified to a transforming encounter with God through this series. 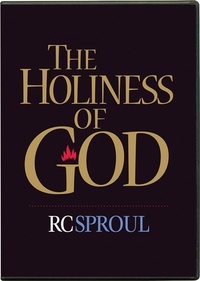 R. C. Sproul's series is a wonderful place to begin to discover or rediscover the truth about this essential doctrine. I presented this to my Bible & Life Group and it was very well received. Everyone appreciated its teaching. One couple (long-standing members of Christian churches) said that they had never heard this stuff before, that it was the deepest teaching they had ever heard, and that it had nourished them. All to the glory of God! What better endorsement is there? Introduced by a friend at a deeply distressing time in my life, this series changed the direction of my Christian walk. It set me on the path of righteousness, with an ever-increasing gratefulness to God for His truly amazing grace. No other book, movie, sermon, or conversation has approached in level of impact, except the Bible. Interestingly, it was this teaching series by R.C. Sproul that revolutionized my understanding of the WHOLE Bible! Please watch this series. R.C. Sproul's depth of biblical understanding and great love for the Lord shine through. This series glorifies God to the highest. I left these six messages wanting more. I was given these tapes by my minister to help me prepare for a 12-week class on Holiness. Little did I know how much of an impact these would have on me. Since I spend about 2 hours a day driving, I have been able to listen to the series some 5 times. My seventeen-year-old was also moved by Mr. Sproul's insight on the 'otherness' of God. Through this series, I have come to learn that Holiness is more than just pure living. Insted, I came to a greater appreciation and respect for God's ineffable attributes. Also, read the book. I'm reading it for a second time and cannot put it down. Thank you Mr. Sproul for your heart and your ability to teach on such a difficult subject.